Arizona Roots Music & Arts Festival atmosphere. Photo taken by Marissa Novel in Chandler, Arizona. 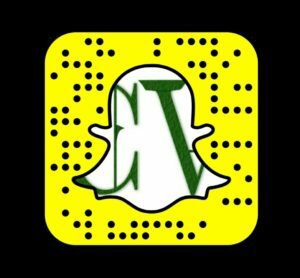 Reggae fans, rejoice. 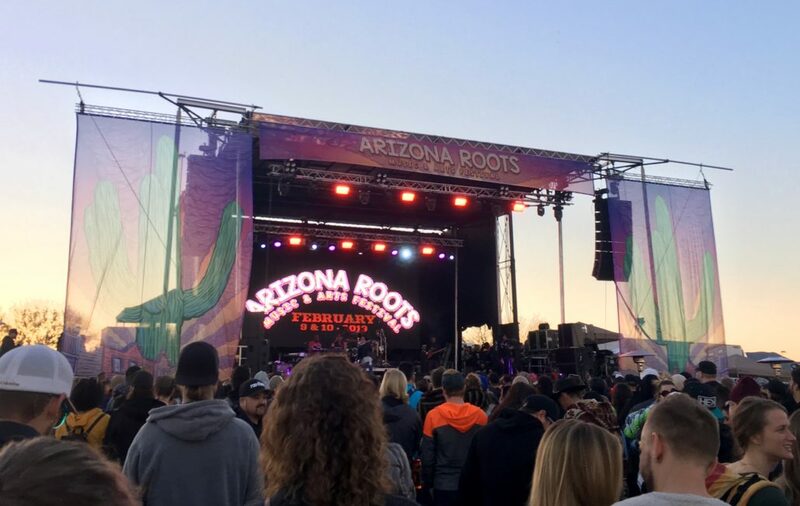 The inaugural Arizona Roots Music & Arts Festival held February 9 and 10, 2019 brought out contagious smiles, good vibes, and great music to match. Stacked with headliners including Rebelution, Stick Figure, Atmosphere, J Boog, Trevor Hall, and more, attendees got a taste of this new festival thanks to the organizers of Cali Roots Music & Arts Festival of Monterey, California, and partner Relentless Beats. The festival, held at the Riverwalk at Rawhide Western Town & Event Center in Chandler, Arizona, was a unique collaboration of music, art, and good company that will likely put smiles on faces again in 2020. 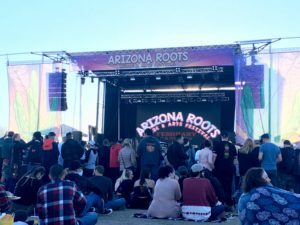 The first day of Arizona Roots started with a lot of positivity from the musicians and fans alike. Upon entering the venue and walking over to the main stage, I caught eyes with another festival goer and exchanged a warm smile. We were walking solo in separate directions, but could both feel the overwhelming love from the festival already. Trevor Hall’s mid-afternoon set at the Main Stage had impressive numbers swaying back and forth to his sweet tunes. The sun was hiding behind small clouds all day saving festival goers from the typical scorching Arizona sunshine. The rustic, Rawhide Western Town venue was softened with string lights around the smaller, Rawhide stage. Attendees lounged and visited on picnic tables at this smaller stage. 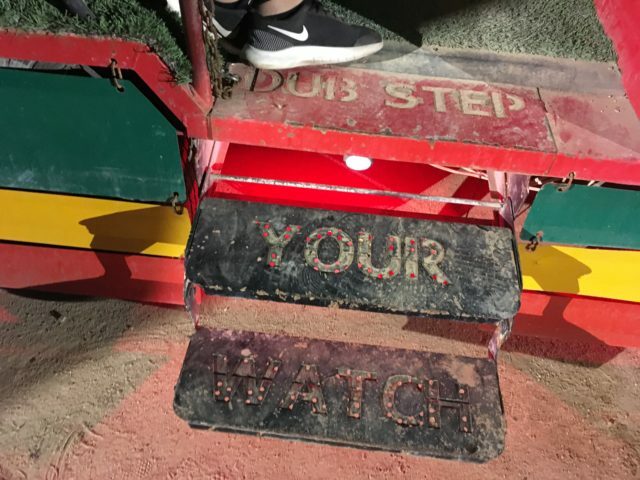 Others got a glimpse of the show from the top of the double-decker Movement of Jah People bus, a rasta-inspired installation that has been to Burning Man and beyond. J Boog performing on the Roots Stage. Photo taken by Marissa Novel on Saturday, February 9 in Chandler, Arizona. Back over on the Main Stage, J Boog’s sunset set blessed the crowd with an energetic segway into the evening. 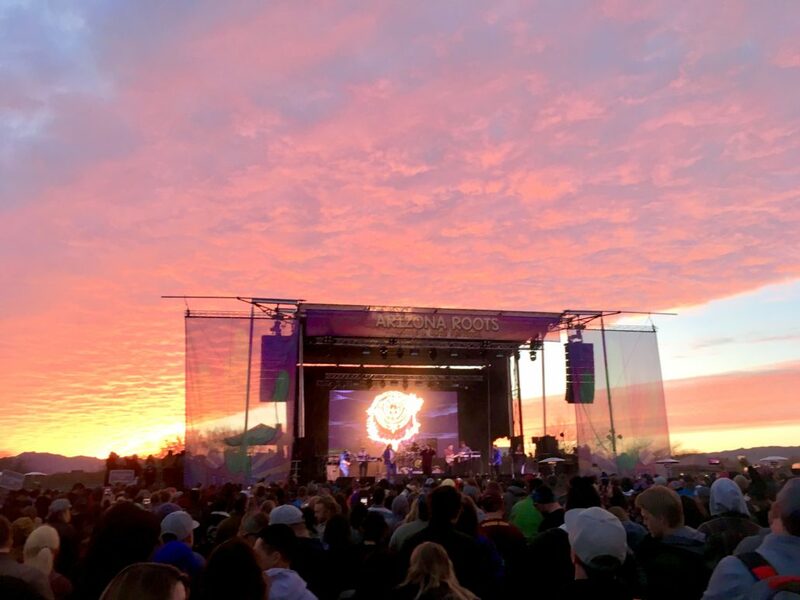 The backdrop of the mainstage evolved into a truly breathtaking Arizona sunset, with the texture from the clouds creating a multi-toned yellow, orange, and purple blanket in the sky. 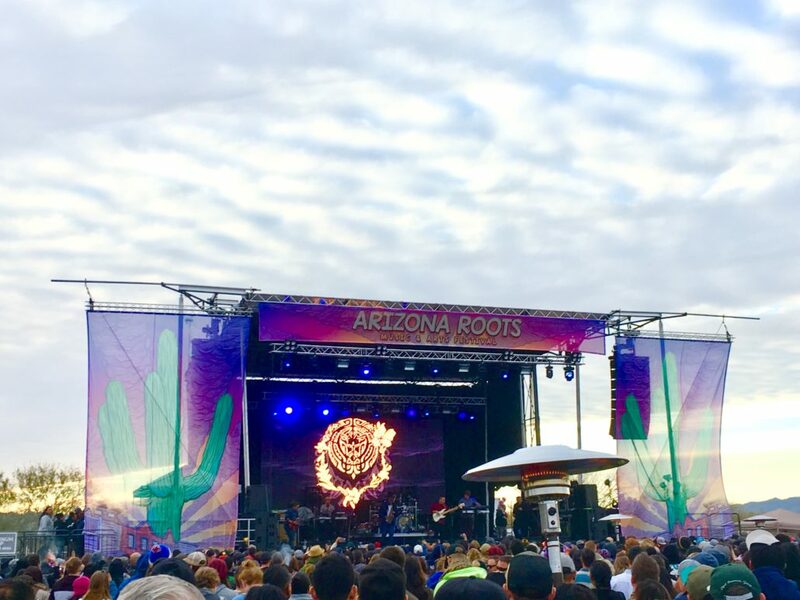 Not only was the sunset gorgeous, but it had an uncanny resemblance to the Arizona Roots Festival poster and promotional materials, tying everything together quite nicely. Both stages at the festival were close together, yet the sound design ensured you could clearly hear each set without interruptions from the other stages. Visual artists worked on murals throughout the weekend beside the Rawhide Stage. The Main Stage also featured multiple picnic tables and hammocks for lounging. What I found to be the nicest touch were the several patio heaters scattered across the field on the left side of the Main Stage. With cool Arizona nights, these heaters go a long way. Atmosphere began the first Main Stage set of the night with heavy beats from “Shoulda Known.” By this time, the crowd was getting chilly with the sun having set and the temperature at just 55 degrees. Atmosphere quickly warmed the crowd their classic “Sunshine,” and softened us up again with “Yesterday.” This was likely the most roller coaster set of the night, with Atmosphere’s dynamic energy taking us along a genuine storytelling experience. It’s no wonder why this hip-hop duo has been going strong for the last 23 years. 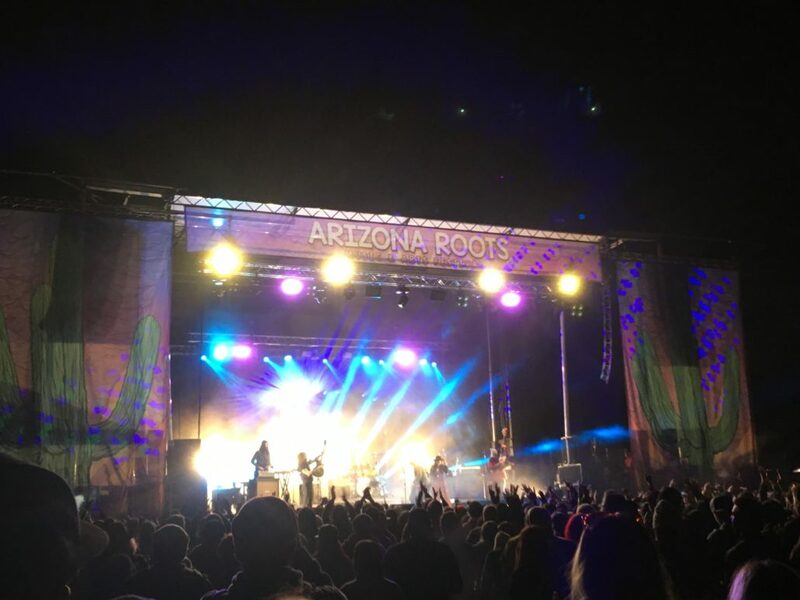 Reggae All-Stars Rebelution closed out the Main Stage, giving the end of Arizona Roots Day 1 a zen and peaceful vibe. The second day of the festival began with the same, cheery sentiment. The sun was shining, and things were warming up. Movement of Jah’s crowd on Saturday. Photo by: Marissa Novel. The Movement electrified the Main Stage in the late afternoon, performing “Habit” and other crowd favorites. The relaxed ambience of the area quickly turned joyful as festival goers grooved to the music. Collie Buddz eased us into the night with catchy, mellow tunes. Next, Xiuhtezcatl delivered conscious hip hop and a side of social justice with a lively, hard-hitting performance on the Rawhide Stage. The rapper was accompanied by his band, including his sister Isa on vocals and the keyboard, as well as a drummer and violinist. The group delivered heartfelt messages in solidarity with marginalized people and those resisting environmentally harmful oil extraction methods such as fracking. Although the group’s message was intense, they loosened up the crowd with an exciting cover of “Feel Good Inc.” by Gorillaz. Xiuhtezcatl’s performance Sunday. Photo by: Marissa Novel. Indie roots group Dispatch brought in the first Main Stage set after dark, ending the set on an upbeat, righteous note with “Letter to Lady J,” a song written in 2018 dedicated to innocent people slain by law enforcement. The song hits close to home with so many of today’s issues, yet inspires us all to collectively come together and make a difference for the better. 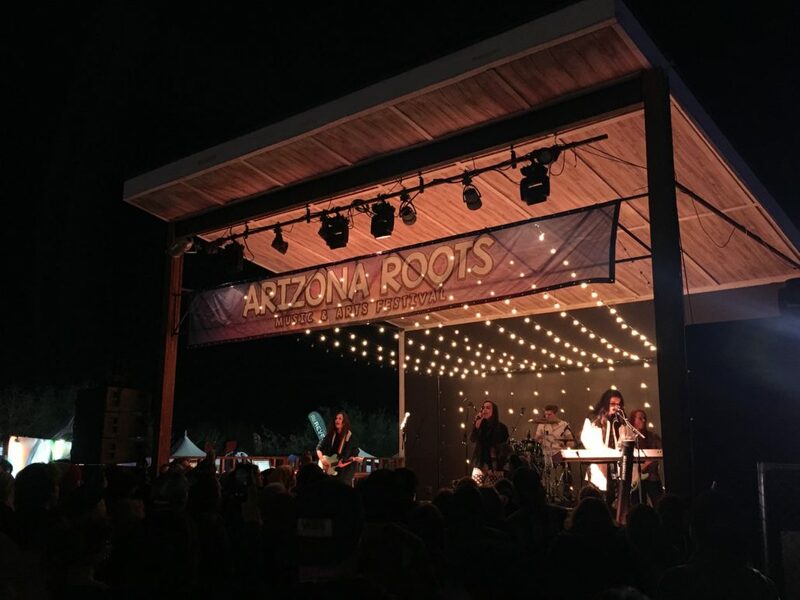 Overall, for the first event of its kind, Arizona Roots went off without a hitch. This is an impressive feat, as just about anything unexpected can happen with a first-time festival. 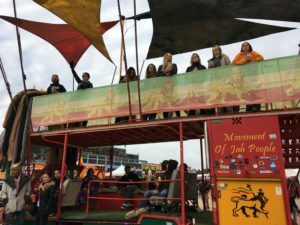 Authentic themes of justice, resistance, love, and unity were present throughout the weekend. Arizona Roots seemed to fill a necessary void in the Arizona reggae scene, providing residents and visitors with an event dedicated to the roots movement and its culture. Stick Figure’s set Sunday. Photo taken by Marissa Novel in Chandler, Arizona.